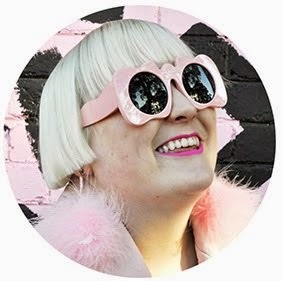 Olive & Finn is a new made to order label in Melbourne that I have just found, thanks to Emilia the model in their lookbook who just so happens to be the editor at Melbourne Street Fashion.com as well. All the Olive & Finn pieces are made to your measurements in your choice of colour and most pieces are around the $70 mark (or even less). How amazing is that? I especially love the oversized tank dress with fringe and the Gathered shoulder cardi. Looks like I have found a way to already spend my first pay cheque from my new job which starts today. It's really exciting how many new designers keep popping up, even during this "recession", its almost like there is even more creativity happening because of it. I agree! I think there is more and more creative talent emerging not just in Melbourne, Paris, or Tokyo, but ALL OVER the world right now, recession or not! I feel like the average person is much more fashionable even than they were 2 years ago. (Most people). I think if we get over this recession anytime soon, the styles will become even more intense and extreme..even for the mainstream. 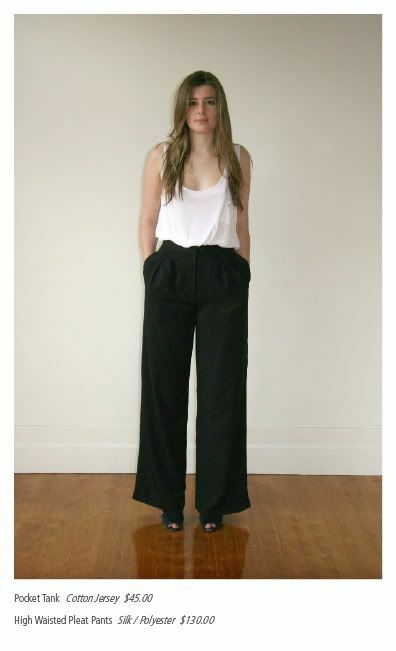 Love the highwaisted pants & loose tank - gorgeous! Oh I love it and I thought I've seen that model somewhere before! You posted a picture of her in one of the party photos! oooh you finally got a job? congrats! where are you working? these big trousers are amazing. like this panel jacket aswell!!! i just wanted to say that i really like your blog, it's charming and really does talk about clothes that people wear, not betsey johnson's new spring line. 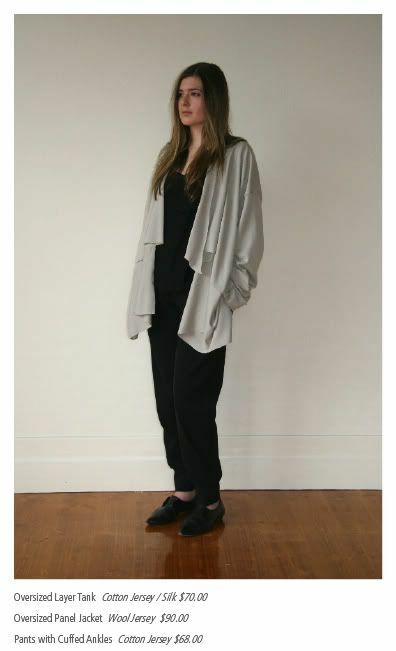 I love the draped cardigans, very simple and chic. I agree about the creativity during recession thing, I'm hoping to buy more unique pieces because of it. I've been reading your blog all day; i love it! Crap. And I just left Melbourne.